Housing Initiatives of Princeton has given the word ‘gate’ a new lease on life — the same service HIP provides for humans. ‘Gate’ in the past few decades has become a dirty word. It started with Watergate, which opened the floodgates of ‘gate’ as a suffix to imply the existence of a scandal — everything from Pizzagate to New Jersey’s Bridgegate. And now there is Babygate. Kingston resident Louise Kekulah wrote a letter to HIP board members about a gate, a baby gate that eloquently freed the term ‘gate’ from its negative demons. Your commitment and hard work has not gone unnoticed, as a result, I would like to take this opportunity to thank you all for the compassion you have all shown my son and me. I appreciate your gracious service of installing the child protective gate in our home. I was very excited and filled with so much joy when I noticed that the gate was installed. Therefore, I am writing this letter to extend my sincere gratitude and appreciation for your dedication and enthusiasm you have shown us. It is the little things that count and you all have exemplified how important it is to have a strong support team. For instance, when I received my citizenship I received a congratulatory card in the mail. There is absolutely no word in the dictionary to have expressed how I felt after opening the card and reading it. You guys are amazing and the best family anyone could wish for in this lifetime! HIP has made me feel completely loved. I will never forget how my life changed for the better after our first encounter with one another. I am deeply humbled by the generosity of Housing Initiatives of Princeton in supporting Malcolm and me in other initiatives such as, putting a roof over our heads and ensuring that we become successful despite the turmoil life brings. Having a diverse group of educated women around me with knowledge and experience to confer with has made me feel so much more confident in this competitive world. I one day look forward to being in [a] similar position to serve others and give them just as much hope as you guys have given me. The Babygate story is fodder for an inspiring religious sermon rather than a scandal-focused tabloid. Carol Golden, HIP chair, explained the wonderful simplicity of the baby-gate donation. Kekulah said the gate and the support her HIP family gives here is a miracle, especially since she doesn’t have any relatives living nearby. “HIP not only has provided housing that I could afford, but also provided an entire family for me,” said Kekulah, whose immediate family is in Liberia with other relatives scatted throughout the United States. “I feel very taken care of." Suddenly, she found herself in a position of being the one who desperately needed help. She had a baby, whose father abandoned Kekulah and their child. Kekulah was renting one room in a house, and the arrival of the baby made this living situation unsatisfactory to her landlord. Existing on her salary as a clerk at QuickCheck, she had no idea where to turn other than to the internet. Searching for affordable housing, she came across Housing Initiatives of Princeton. “God answered my prayers,” she said. Kekulah will turn 24 Oct 14, coinciding with HIP’s “Rent Party” benefit at which Louise and Malcolm will be celebrated. Also celebrated at the event will be the generous members of the community who lease housing to HIP for minimal return (tenants’ rents are based on the ability to pay). Housing Initiatives of Princeton’s Rent Parties provide an opportunity for neighbors to help neighbors, by donating money to support transitional housing, emergency rental assistance and wrap around supportive services, such as installing a baby gate. Louise’s two-bedroom condo is owned by Gavin Thomas, who connected with HIP, when he, like Louise, was in his mid 20s, but in very different circumstances. Gavin became aware of HIP thanks to his mother Annie Thomas. She worked for 13 years as the parish administrator for Trinity Church Princeton, one of the organizations that played a pivotal role in the birth of the HIP initiative in 2001. I was unable to talk to Gavin, who now lives in Washington DC, but did track down Annie Thomas. Gavin on his 25th birthday was “so very fortunate to receive some funds from his grandparents,” Thomas said. Although Gavin was reluctant to be a landlord of any sort, his mother, familiar with the HIP model, suggested that he could use his gift to purchase a residential property, lease it to HIP, and help provide some much needed relief to others, while simultaneously protecting the value of his gift. “HIP tenants are the most responsible of tenants, and so I would recommend this model to anyone who is indeed able to offer this fantastic mission their support,” said Thomas, urging others to open the gates of their residential properties and welcome HIP clients. A family consisting of two working parents and two small children were with HIP for two years. Although the father was working at a local food store and the mother was working as a cashier at a take-out food establishment, their combined income was not sufficient to cover the rent for their apartment in town and they became homeless. Upon moving into the Prescott House, a case manager, HIP board member and the parents started identifying needs and collaborating on a plan to improve their circumstances. A local dentist who is a “Friend" of HIP completed dental work for the family pro bono, giving an instant ‘boost’ to the family member’s self esteem. HIP paid for the mother to receive job training as a certified Phlebotomist resulting in part-time and then full-time employment at the Medical Center of Princeton — a position that also provides medical insurance. As their vehicle was dying, another “Friend" of HIP (who had two vehicles, but needed only one) generously donated a reliable vehicle to this family so they could get to child care, work, etc. After graduating from HIP, this family secured a permanently affordable apartment in the area. A single mother with four children — one away at college, one at Princeton High School (PHS), one in Princeton middle school and one (with a chronic illness) in Princeton elementary school — lived in HIP housing for one year. Although the mother had a good job, she was in debt and faced eviction from a local Landlord. She was determined not to compromise the children’s educational opportunities and pursued all efforts to stay in town and keep them in the Princeton schools. 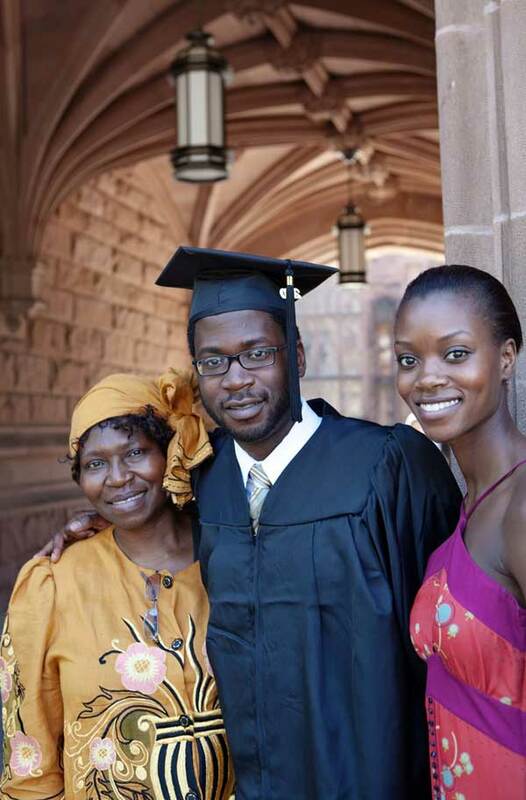 By moving into an HIP home, the family was able to stay in town as the son graduated from PHS and enrolled in Princeton University. While living in HIP’s transitional housing, a board member who is also a financial planner, worked with the mother intensively to help her resolve her debt and clear up her credit. Having long dreamed of home ownership, with her improved credit she was able to purchase a modest duplex unit in Princeton. The son went on to graduate from Princeton University and earn a law degree at Georgetown University. Heather and her two teenage sons were homeless and searching for temporary shelter when she contacted Housing Initiatives of Princeton and spoke with then-Board Chair Ruth Scott. “I couldn’t see beyond the fact that I was homeless and I had these two children with me,” Heather remembers. That December, the family moved into a 2-bedroom HIP home in a mixed-income complex in Princeton. Because they were in transitional housing the two boys, ages 15 and 16 when they moved in, were able to continue to attend the West-Windsor Plainsboro High School North, ranked 16th in the state of New Jersey. “It didn’t feel like a shelter; it felt like a home. That is what attracted me to it,” explains Heather. When HIP accepts a family, it doesn’t just provide them with a home. HIP offers a holistic set of services that are designed to help families chart a path to financial stability and self-sufficiency. Heather took full advantage of those supports. She enrolled in classes at Mercer County Community College where she took classes that she hoped would prepare her for a future career in social work. She also secured a job at the Princeton office of The Institute for Wonderful Working Women for Empowerment. The Institute provides mentoring and leadership development services to promote the economic well-being of minority women. Working there enabled her to better understand the field of social work. The counseling and budgeting support she received through HIP also helped her better manage her family finances. The following October, the family transitioned into a permanently affordable apartment unit at the Mews at Princeton Junction. HIP helped them as they moved on, providing the security deposit for them on this new home.